Hello! This is Aidan. Sorry, we haven’t been posting because we didn’t have Wi-Fi for the past two weeks, because we went on a cruise! 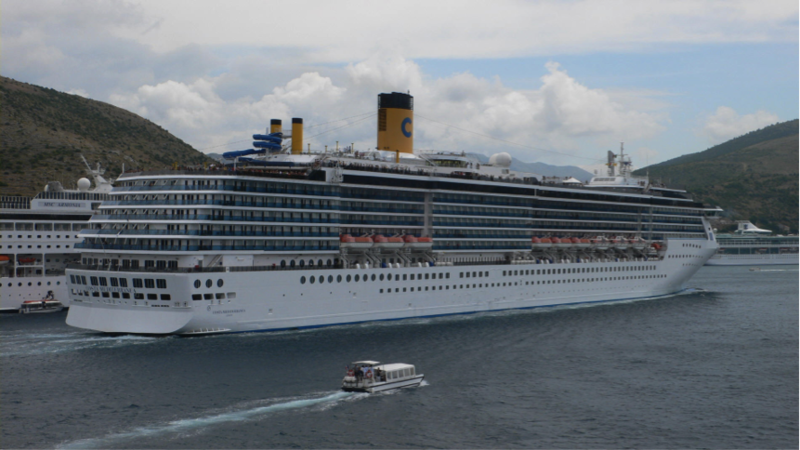 The cruise line was called Costa. It’s owned by Carnival Inc., along with a bunch of other companies like Holland America and Princess… and almost every other cruise line I’ve heard of. We all shared a small but comfortable cabin at the front of the boat that had only one large bed and a bunk bed. When we first got on, we had to do an emergency drill. There’s an alarm in our room, so the 7 short 1 long whistle was so loud, we couldn’t even shout to each other. We got life jackets and went to our Muster Station and they made us stand in organized lines and they counted us. When we got back to our room, they had brought our luggage in! Our first stop was Barcelona, Spain, home to one of the best soccer clubs in the world: FC Barcelona. We took a tour/excursion provided by Costa to see a bunch of Gaudi (famous architect) projects. First we went to the top of a cliff that had a great view of the city. 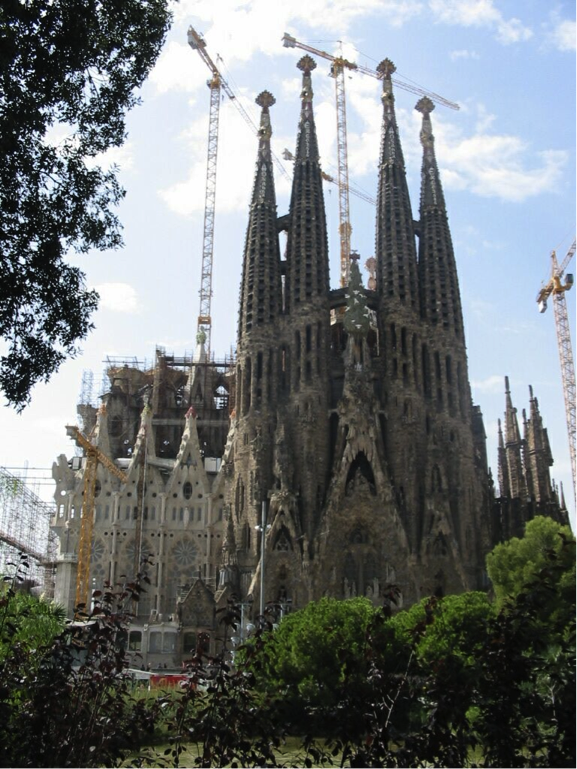 The next thing we saw was Sagrada Família, a massive and beautiful church that wasn’t completed when we saw it. The original architect didn’t finish the plans, so Gaudi took over in 1883, using a Gothic and curvilinear Art Nouveau style. It is still under construction and is expected to finally be complete in 2026. Next, we went to what is now a park, that was intended to be a nature city. Count Eusebi Güell wanted to have a city with more plants and trees and less pollution and huge buildings. He bought a 42 acre hill that he wanted this city on, and had Gaudi design the plans. Unfortunately, nobody moved into this place because it was too far from the main city of Barcelona and transportation back then wasn’t as good as now, so it is now a huge, beautiful, and colorful park. The next place is the Barcelona cathedral known as La Seu Cathedral. Romans first had a temple at this location in 343 AD, and an earlier cathedral was built in 1035. The current building was started in 1298, but not finished until 1913, with the addition of the central spire. It is also connected to the palace of Barcelona. There are also always 13 geese in the courtyard. Each goose represents one year in the life of the martyr Santa Eulalia, a young girl supposedly tortured to death in the 4th century by the Romans for her religion. The food on the boat was quite terrible because all of the ingredients had to be frozen, and we had to eat the bad food because we were stuck on the boat. We had a day at sea, and Willem and I played lots of Foosball. We also met a 12 year-old from Switzerland named Eric. He spoke English, so we spent lots of the day with him. The next day we woke up in Casablanca, Morocco, (New continent for me!) 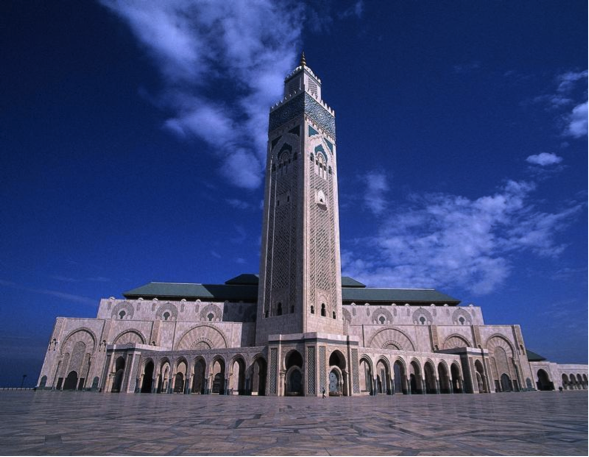 where we did an excursion that showed us the third largest Mosque in the world, the Hassan II Mosque. It also had the world’s tallest tower on a Mosque. The building was really nice; not crumbled or anything. Everything about it was perfect. The inside was soooo huge, and I’ve been in the Boeing building in Everett. Also in Casablanca, we went on a short shopping trip, we went in another church that had beautiful stained glass, and we saw the Royal Palace of Morocco. Next country: St. Cruz De Tenerife, an island of the coast of Spain. Here, we went on our own instead of taking an excursion. We took a taxi to Loro Parque (Parrot Park). There we saw lots and lots of parrots and other colorful birds, white tigers, an emu standing under a bridge (We thought that would be a good poem), Loro Parque is famous for their penguin habitat (which is indoors). It has fake snow, and the water has plenty of fish! 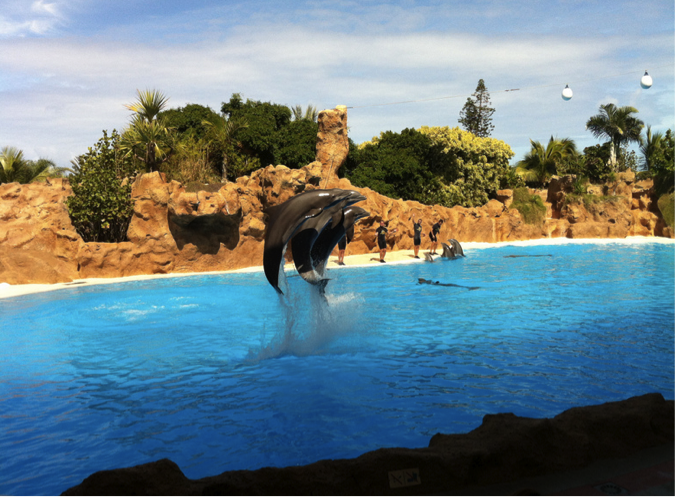 The highlight of the zoo was the dolphin and orca shows. We saw the dolphins first, and they did flips, jumped fifteen feet out of the water and over a rope, and even pulled a baby from the crowd in a little boat. Finally, we went to the orcas. Willem and I sat in the splash zone, which was awesome. 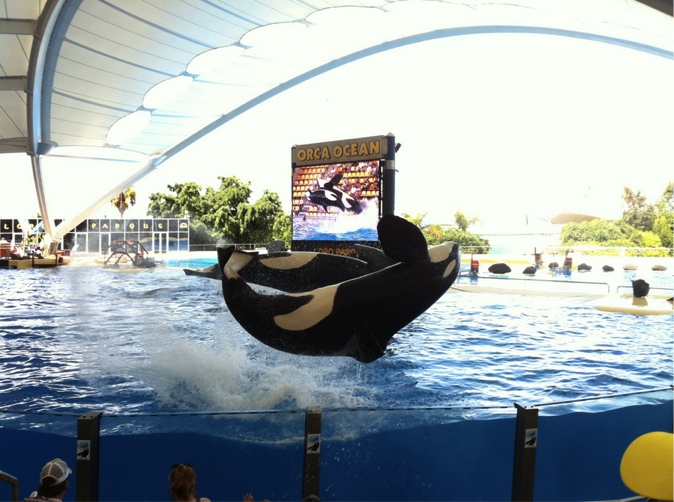 Willem decided too late that he didn’t want to sit there… At the beginning, the big TV over the orca tank showed a bunch of people from the audience and even had speech bubbles. Then the orcas did a bunch of tricks similar to the dolphins, except they purposely splashed us. 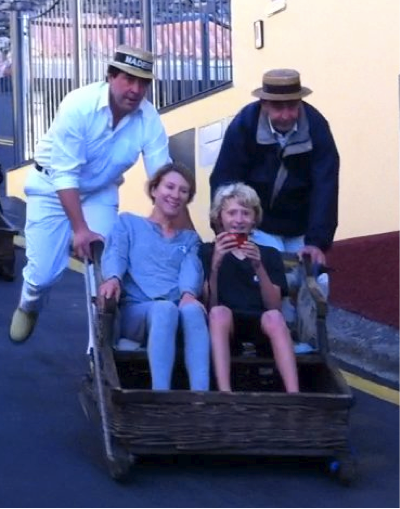 The ship then took us to Madeira, an island of Portugal. Another bus excursion took us to the top of the city which is on a steep hill. Here, we’re going basket riding! Wicker basket toboggan riding is a traditional thing they do in that city, because the rich people who had summer houses on top of the hill needed a faster way to get back home in the fall. Two guys push you down a long hill in a basket. You just sit inside it, and they stand on to pegs in the back. The basket has rails on the bottom, so you just slide down the hill! After that thrilling ride, we drove around the island’s large hills and saw lots of farms and waterfalls. We had lunch at a restaurant that rotated like the Space Needle, then drove back after taking pictures. After a day at sea, we arrived at Malaga, Spain. 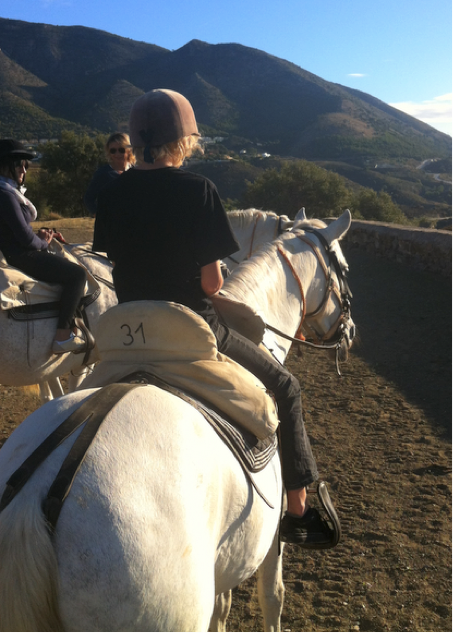 Here, we drove out to the country and went horseback riding, which was really fun. After that, the cruise ended for us at Rome, Italy, and we rented a car and drove out to a place by a lake that’s an hours drive from Rome, where we drove to after three days. We arrived today in Rome, returned our car, and then relaxed because traveling from place to place for us is quite difficult and tiring.